Click here to download the ‘Check List for Moving’. Empty trash-baskets, ashtrays, diaper pails. Make sure anything needed in-transit is separated. Put jewelry, coin collections, etc into your suitcase. Put birth certificates, hours & important papers into suitcase. Clean out refrigerator. Dispose of perishables. Take down anything nailed or screwed into walls. Dispose of flammables & combustibles: bleaches, paints aerosols. Computer: secure your hard-drive and disconnect. Empty: lawnmowers, radiators, tanks of fuel. Take draperies down and hang on hanger or fold. Complete our statement of customer responsibility. We cannot by law move plants to some states. For questions please feel free to call our office. Make sure appliances, satellite, swing sets, pool tables, trampolines, etc have been disconnected by either yourself or a service company arranged. Remove snow from driveway and sidewalks. Salt if needed. Place your luggage and needed items in car or closet with a sign “don’t move”. 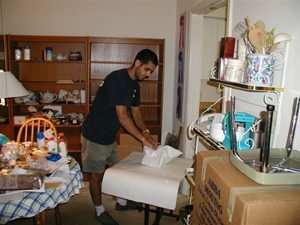 Show crew the items in your home that need special attention or insurance. Give crew leader the filled out statement of customer responsibility. Before signing anything: walk through home and make sure all is loaded. Secure pets, remove snow, plug in phone. Ask driver for copy of the inventory. Stand near doorway of your home and “check-off” items on inventory, as well as give general directions as to placement in your home. Once truck is empty, confirm all items received. Advise driver what, if anything needs to be unpacked. NOTE: unpacking is removing contents of cartons and placing on a designated surface. Open any box that had a high value item noted on statement on inventory. ABBA Moving 2000. All RIGHTS RESERVED. Developed by Computer Services Unlimited, Inc.